The Nipper program is all about having fun, getting kids fit and active whilst educating them about the beach and the surf. 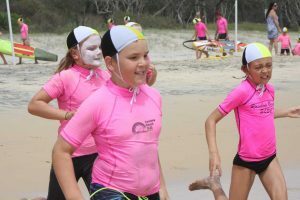 Nippers is a fantastic way to get involved with a great club and maybe, one day, these kids may choose to become lifesavers themselves. Surf lifesaving is a great family activity and at the least, what the children learn at Nippers could one day save a life, be that their own or someone else’s. If you would like to get your kids involved, please come along to one of the following sign-on days to register. The carnival is scheduled to be held on Saturday October 13 so competencies will need to be completed early. Nippers start Sunday October 7. Would you like to sponsor Nippers? The Rainbow Beach Surf Club are currently seeking sponsors for the 2018 Age Managers shirts. These shirts will be black and white check with ‘Age Manager’ written on the back. Sponsors names will also be written on the back of the shirt for all to see on Sunday mornings. If you are able to sponsor, a single shirt is $75 or pay just $500 to have your business name on all the shirts. To find out more, call the club on 5486 3249.